Edison State students taking Fundamentals of Communication courses on the Darke County Campus have the opportunity to work outside of their comfort zones for 26 hours during the semester. While the option is adaptable according to individual circumstances, students are encouraged to learn the value of communication by tutoring younger students who may be struggling with their academics. In most cases, this will be in the Empowering ASP, which is almost exclusively supported by Edison State faculty, staff, and students. Another 10 students, due to schedule conflicts, chose to work with children in their local districts or older citizens in health care facilities. 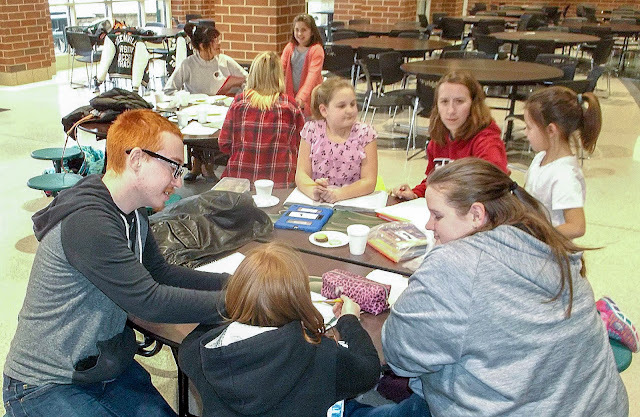 While the tutoring (or alternative) option is the major one, Edison State communication students also have the opportunity to go into different Darke County school districts to talk to students about making the right decisions in their lives. In the fall, they talk to young people about bullying; in the spring, the topic is drug abuse. Their messages are age-appropriate for kindergarten through sixth grade. Over the years Edison State students have made presentations to kindergarten through sixth grade students in Greenville, Arcanum, Mississinawa Valley, and Ansonia. The Edison State student impact on the community each semester is substantial. During Fall 2017, 113 Edison State Darke County students provided 1,687.5 hours of service to the community. Most of the effort came from current communications students. Students from other Edison State Darke County Campus classes, both current and former, also participated.